The Mallee Region has the above soil orders that you can link to. These soil orders have been classified using the Australian Soil Classification. Broadscale overview soil maps are presented for each soil order (using the Australian Soil Classification) and should only be used as a general indication of their distribution. These overview maps have been developed by Jim Rowan and are based on Land Systems mapping. There are five main Soil Categories in the Mallee Region and these are listed below. Each of these Soil Categories contain one or more Soil Orders. Texture contrast soils are those that display strong texture contrast between the surface (A horizons) and the subsoil (B horizons) e.g. sand or loam over clay. In the Mallee region, there is one soil type called a Sodosol (using the Australian Soil Classification) with strong texture contrast, previously referred to as Duplex soils using the Northcote Factual Key. Sodosols have subsoils which are not strongly acid (i.e. pH >5.5 in water) but are sodic. Their surface texture ranges from sandy loam to clay loam over medium to heavy clay. In the Mallee region, Red Sodosols are the most common. These soils are now referred to as Vertosols using the Australian Soil Classification. They are clay soils that shrink and swell causing seasonal cracking as the soil dries out. Vertosols occur on alluvium and associated lake bed deposits, along creeks and rivers as well as on broad low-lying plains in the northern Mallee. Rudosols are young soils which show little development. These soils are widespread in the Mallee region within the Big Desert and Sunset Country. Tenosols are shallow, weakly developed soils that show more profile development than Rudosols. They generally have low water holding capacity and fertility. 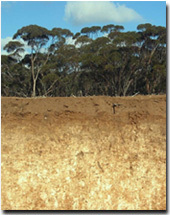 These soils are widespread in the Mallee region within the Big Desert and Sunset Country. These soils are referred to as Hydrosols and are saturated for many months of the year. They are not mapped here (due to mapping scale constraints) but do occur in the region often associated with former lake beds. Many of the soil in the region can be calcareous in the subsoil (especially Sodosols and Vertosols developed on basalt and Dermosols developed on marly deposits). Calcarosols, however, are soils that do not have strong texture contrast between surface and subsoil horizons and are calcareous throughout the soil profile. These soils are restricted to some coastline areas in the Corangamite region.